This week we are introducing our solid color dog figurines! We have already introduced our custom painted dog figurines, which you may be familiar with but we will give you a quick rundown of the process. Customers upload photos of their dog to our website and select a dog breed figurine that matches their dog. We then custom paint the dog figurine to match the colors and markings of the customer’s dog. These figurines make amazing memorials for past pets. But, the one issue with custom painted figurines is that the colors and patterns of the dog may not match your home decor. If you have an orange pomeranian and a beautifully modern home with gray tones then the two may not match up. You may not be able to find a place for the figurine to fit into your home decor. This is what led us to the idea for our solid color painted dog figurines. Solid gold, silver, white, and more will fit perfectly into your home decor. 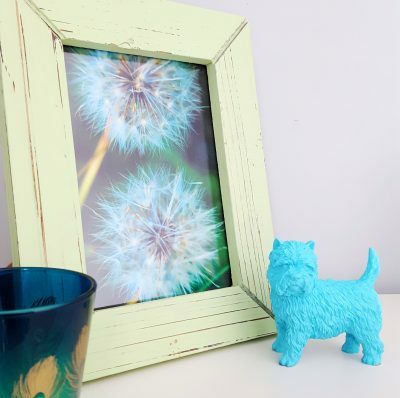 Add a pop of color in a children’s room with one of our pink or blue dog figurines. Fit one of our solid gold figurines into your glamorous gold themed home decor. 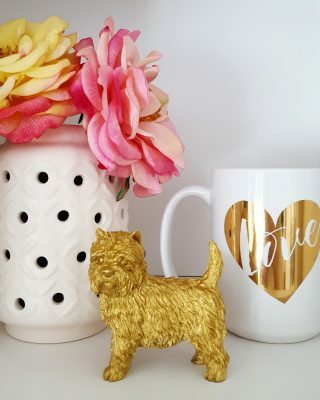 Even better than fitting a cute dog figurine into your home decor is finding the perfect cake topper for your wedding day! Brides absolutely love their dogs and they want to include them on their special day. Now, with our solid color dog figurines, any bride can find a dog cake topper that will blend right in with the colors and theme of their wedding day. Place a white, silver, or gold dog on any tier of your wedding cake to finish off the day’s look! The possibilities are endless with our solid color dog figurines, the limit is as far as your imagination will take you! Simply click the drop down menu on the figurines page to select the solid color finish you would like your figurine to be.